Home / Blog / Guillotine Gem. Wandering down the canal as you do I came across this interesting Stop Lock, I realised that it resembled the threatening French guillotine. 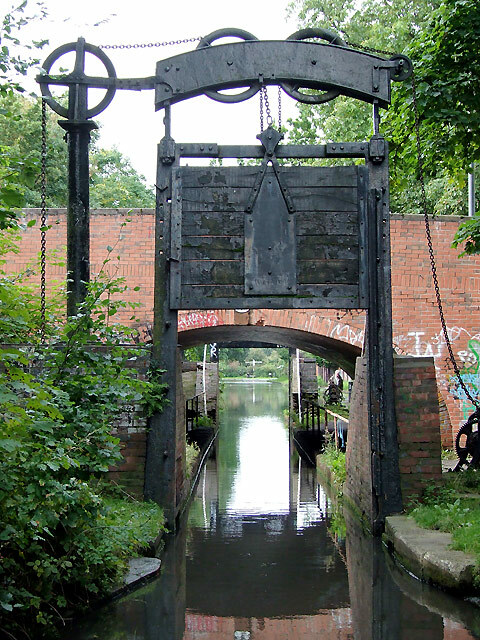 After some research I found out that the guillotine styled stop lock is the only one of its kind on the canal (If I’m wrong with my research please let me know as I’d be interested in seeing more of these wonderful engineered gems). The grade II guillotine is wooden with a cast iron frame. It dates from the 19th century and was recorded to have been last used in 1959. As the guillotine is no longer in use it remains permanently open. 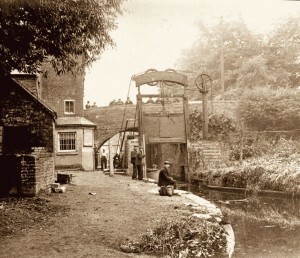 This stop lock was built to prevent water flowing from one canal to another, regardless of which side was higher, but normally the Stratford-upon-Avon Canal was six inches higher. Canal companies were always concerned with the conservation of their own water supplies. The wooden guillotine style gates are suspended in a slightly raked cast iron girder frame by a chain which passes through a small block on the gate. One end of the chain passes over two large wheels to a winch mechanism. The other end passes over two more large wheels to a hidden counterweight built into the side wall of the lock. There was no need for paddle gear to fill or empty the lock. With such a small difference in water level a guillotine gate could easily be lifted to let water flow in and out. 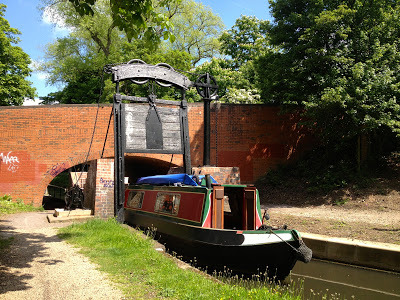 If you fancy visiting this awesome engineering wonder you can find it between Kings Norton junction and Lapworth Wharf. If you are prone to walking from Stirchley along the canal you’ll eventually come across it. Even though it needs tender loving care it really has a presence when you approach it, its black silhouette is so dominate and stunning, I think it’s a great engineering piece and something to be proud to have in our region as it’s so rare. 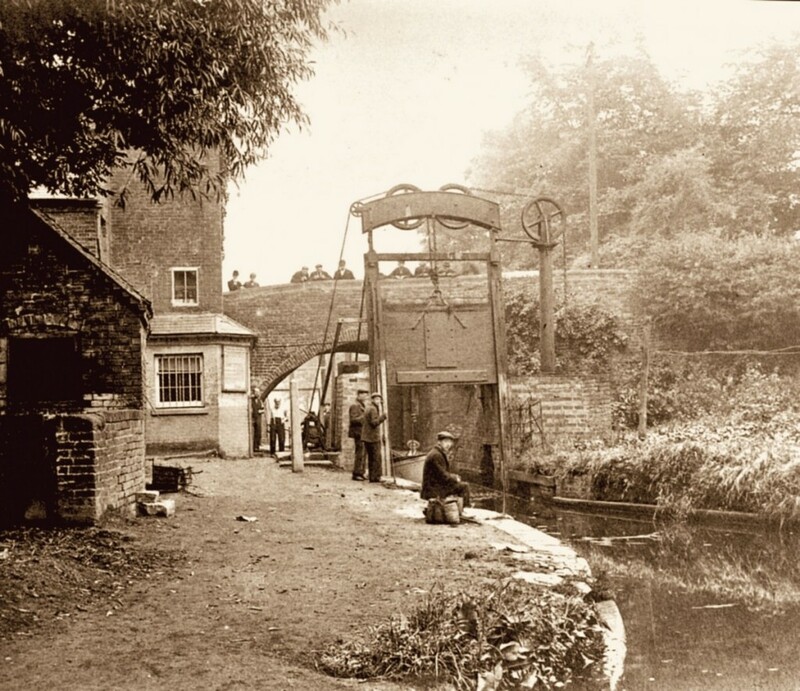 Lovely old photo of the stop lock. Joanne, I’ve only just seen this. It’s really interesting. I live not far away so will have to wander down to take a look!